Biryani is a staple dish in dinner party or in other words, no dinner party is considered complete without Biryani on the table. Even many families prefer to make it on the weekend. Biryani keeps a history that tells us how the dish originated then traveled from different areas and arrived in the subcontinent through Afghanistan. 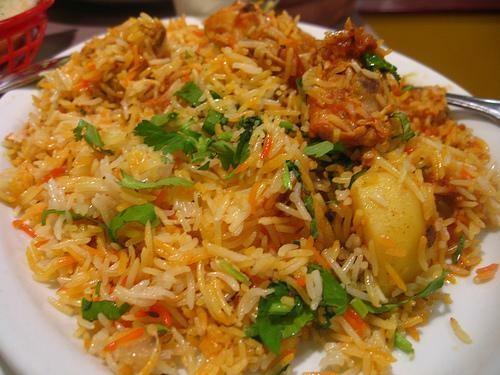 Historian claims word biryani drives from the Persian word birian, which means frying the food before cooking it. The legends preparation method of biryani was different than today. They first fried the washed rice in butter or ghee because they believe it gives a delicious taste to biryani moreover frying burnt the starch gelatinizing the outer layer of the rice. Separately a lamb leg was marinade with a mixture of yogurt, spices, papaya and cooked. After that cooked meat and half cooked fried rice were set in layers and rose water and saffron sprinkle on top for a delicate aroma. At the end pan sealed and allowed simmering on low flame until rice fully cooked. This was the story of olden times. In today’s world biryani is made with chicken, lamb, beef, fish and prawns. Mostly the meat is cooked separately in spices along gravy and rice boiled separately with some whole spices. Then layer rice and meat; top with mint leaves, coriander leaves, kewra water and food color. Then keep rice for simmering on slow heat (typically called dum) until done. In both ways the meat and rice cook separately and then brought together by steaming them in a pan. Spicy colorful biryani spread the pleasant aroma when serves. Biryani is usually serve with a condiment like raita or salsa. Biryani and Pulao both are made with rice and meat but the cooking method, taste and texture of two are totally changed. In Biryani rice and meat are cooked separately then arrange in a layer then simmer. On the other side in Pulao, meat broth is made with addition of whole spices then broth is added in fried onion; lastly rice is cooked in this broth. Pulao got the taste from the prepared broth. If we compare the taste of biryani and pulao; the biryani has a strong spicy taste whereas pulao has less spice in it. Biryani is made with long grain rice and meat. The other ingredients include onion, tomato, green chilies, ginger, garlic, yogurt, ghee/oil, whole and ground spices. Sindhi biryani is a popular biryani in Sindh Pakistan. Finger potatoes are also added in this biryani. The other ingredients are all most same. Hyderabadi biryani rooted back to Asif Jah era, which was the Governor of Deccan and appointed by emperor Aurangzab. It got the lip smacking taste by cooking of rice, goat meat and blend of spices. Now goat meat is replaced with chicken as well. Memoni biryani is originated by the Memons of Gujarat-Sindh. The taste rice is very spicy. This is made with lamb, rice, yogurt, fried onion, tomato, potato and common spices. Food color is less used in this biriyani as compared to other biryanis. Bombay biryani belongs to Bombay India. The biryani is consisted on meat, rice, onion, ginger, garlic, potato, green chilies, yogurt, salt, red chili powder, garam masala powder, coriander powder, cumin powder and ghee. 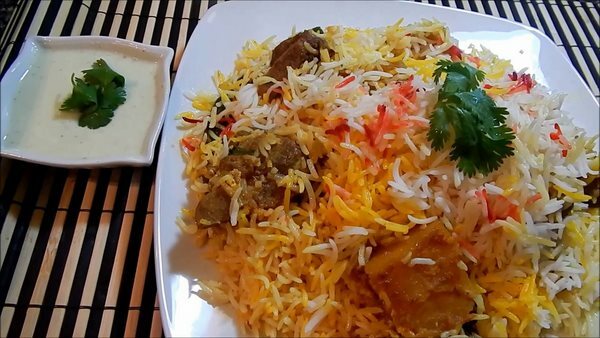 In this biryani rice and meat are partially cooked in separate spiced water. After assemble in layers and remaining cooking is done in dum. This is also called dum pukht method. Bohri biryani is famous in Karachi. It develops the taste with the use of lots of tomatoes. 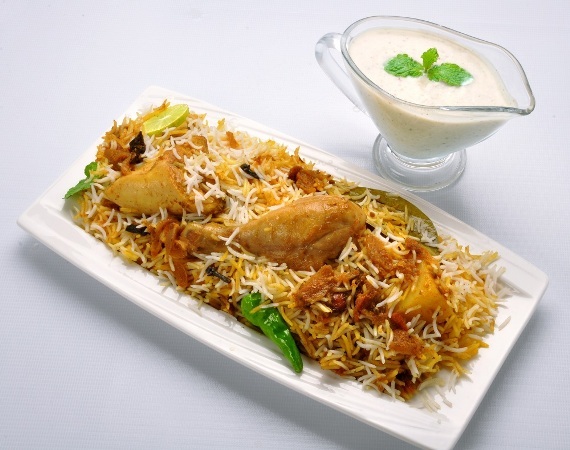 Biryani is made with a variety of ingredients according to taste and preference of family. Mostly this is made with these ingredients. 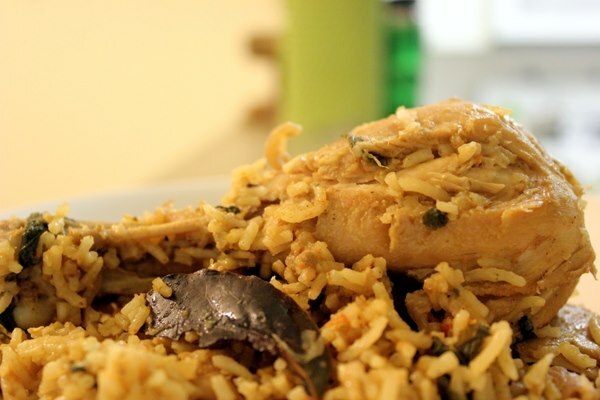 Chicken biryani is one of the most popular versions as it made with chicken. Especially kids love this. Mutton biryani is made with lamb/goat meat. In our part elder people prefer to eat mutton biryani. In this version beef meat is added. In Peshawar and other parts of the county beef biryani is preferable. In Hyderabad, Kalyani Biryani is famous, in which beef is used. Egg Biryani is prepared with boiled eggs. It can also made with leftover chicken rice. Fish Biryani is a popular rice dish in Bangladesh. Another variation in meat biryani is Prawns Biryani. As compare to other biryani recipes this is quick and easy to prepare. This is the biryani for vegan, no meat just vegetables. Usually potato, peas, carrot and capsicum added for making this rice. This is not easy to make a perfect biryani because you need to be careful about use of Biryani Spice ratio and while boiling rice. Though Biryani Masala available in market makes it easy to prepare the biryani. Here is a collection of delicious Pakistani Biryani Recipes those have an exciting taste, just follow them and enjoy with your family. BBQ Chicken Tikka Biryani recipe is by famous chef Shireen Anwar and personally I love this biryani. This recipe is prepared in three cooking steps. First chicken is cooked, secondly gravy is prepared then rice are boiled. After doing all steps biryani is assembled in layers and simmer. 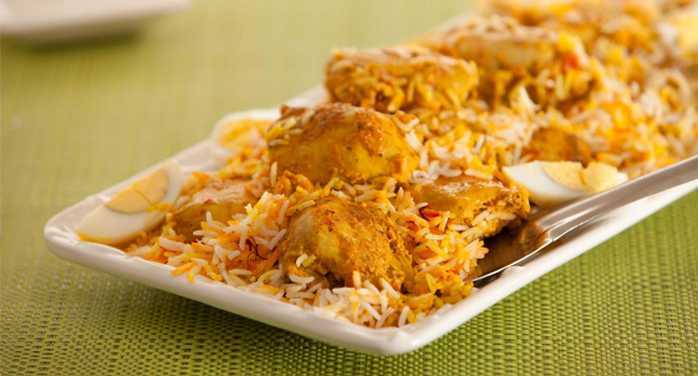 Like other biryani recipes this is also has its typical regional taste especially cooking on dum makes it unbeatable. I will must say do try it. The recipes is little different than other biryani recipes, first you need to spread a layer of marinade chicken then spread 80% boiled rice over it, sprinkle a little water and oil then cover and simmer about 35-40 minutes. Delicious rice will ready. Degi Biryani is made at weddings in pakistan and people just love the delicious taste and often asks in cooking shows how to make degi biryani. The problem is solved by Chef Zubaida Tariq. This is my version of Pulao Biryani. The meat is boiled in water and the stock is reserved then rice are cooked in the stock. A really tempting taste that has the ability to inspire the taste buds. 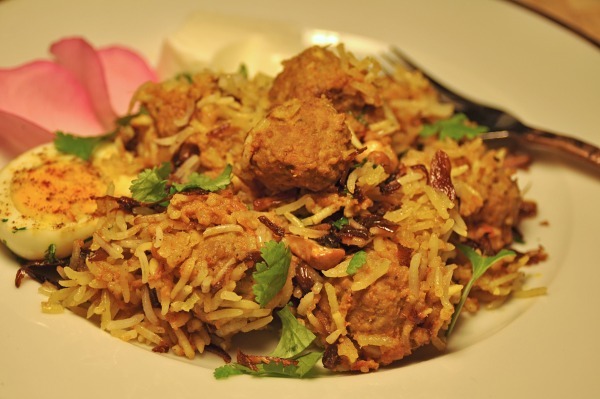 This Biryani is made with meatballs that has a stunning taste. A perfect rice dish to serve at any special occasion. You can adjust the size of meatballs according to your choice. If you like beef then go with ground beef otherwise you also have option to use ground chicken or lamb as well.